Words fail me. This must be seen to be believed. Here is a link to a brief article outlining the science behind the bomb: http://www.lanl.gov/history/postwar/development.shtml. Make sure especially you remember who Edward Teller is. And here the US entered the “thermonuclear age.” How big was the explosion? 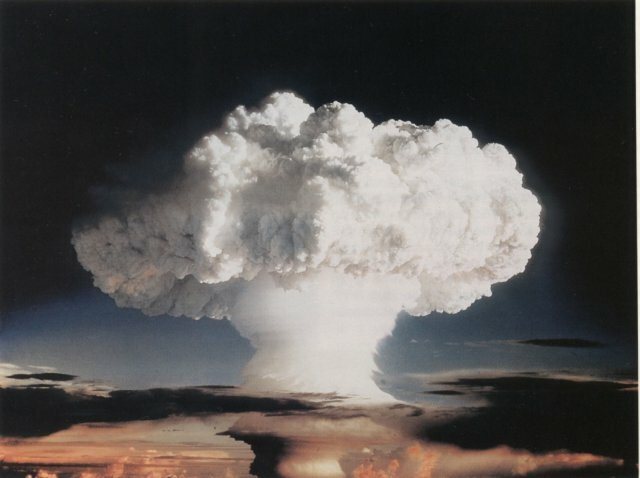 According to http://nuclearweaponarchive.org/Usa/Tests/Ivy.html, “The mushroom cloud climbed to 57,000 feet in only 90 seconds, entering the stratosphere. One minute later it reached 108,000 feet, eventually stabilizing at a ceiling of 120,000 feet. Half an hour after the test the mushroom stretched 60 miles across, with the base of the mushroom head joining the stem at 45,000 feet.” The fireball from the explosion reached a width of 3.5 miles. The crater was 6200 feet wide and 164 feet deep.